Above is current (all graphics from about 14 UTC 31 March) NWS hazards map indicating blizzard or winter storm warnings for the Northern Plains. 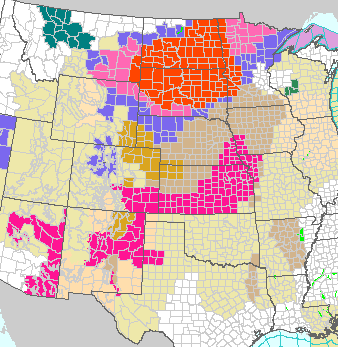 Strong winds and Red Flag alerts for much of the Central Plains and Southwest. 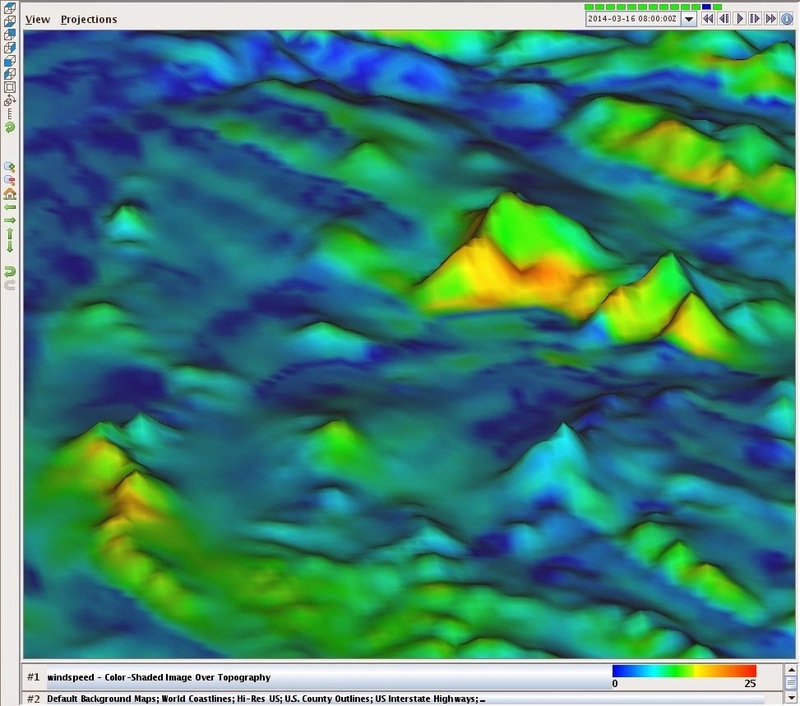 The surface plot below indicates a deepening low centered along the northeast Nebraska border. 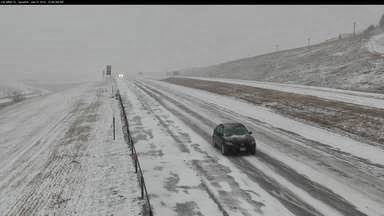 Strong winds and moderate to heavy snows extending from Nebraska Panhandle in a broad arc from northwest to northeast across northeast Wyoming, the Dakotas, and into northern Minnesota. 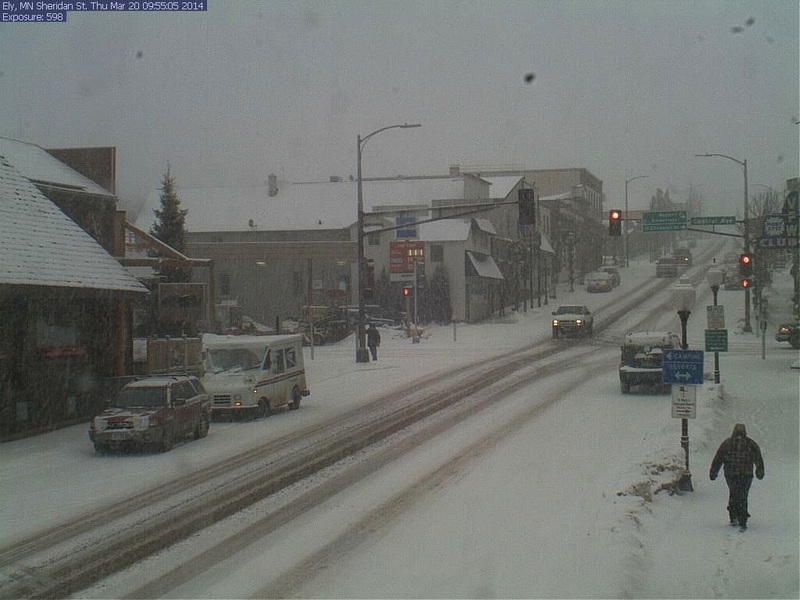 Bottom is current webcam view at Spearfish, South Dakota (along I-90 on northern edge of the Black Hills). It is a cloudy and somewhat dreary morning here in the Tucson area this last weekend of March. 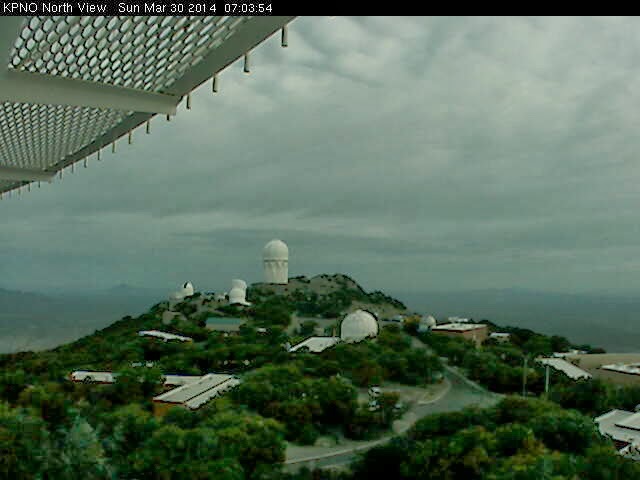 View above is looking north from Kitt Peak. With the cloud cover during the night, temperatures this morning were mild - for example, only down to 43 F here at the house versus 56 F at TUS. There is a Red Flag Warning in effect today for the southeast corner of Arizona - remember that many of the NWS graphics show the area being warned as larger than it actually is. The graphic below is from under the "Detailed Hazards" tab at the NWS web page, and shows the actual warning area (Flagstaff has also issued a Red Flag Warning for the northeast corner of the state). * TIMING...11 AM THIS MORNING TO 7 PM MST THIS EVENING. WITH GUSTS TO 45 MPH. * RELATIVE HUMIDITY...7 TO 15 PERCENT. TO THE GUSTY WINDS AND DRY CONDITIONS. The short wave moving across the Great Basin today will likely lead to a Spring blizzard for the northern Plains tomorrow, an ugly way to close out the month for the Dakotas and northern Minnesota. Graphic above is NAM forecast of surface conditions (with 6-h precipitation and 850 mb temperatures) valid at 18 UTC tomorrow. 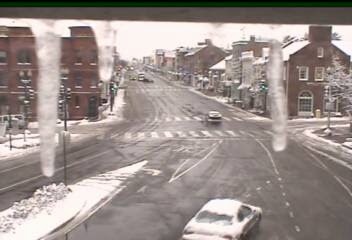 Up in Maine, winter holds sway today with a winter storm warning in effect - see web cam view below. 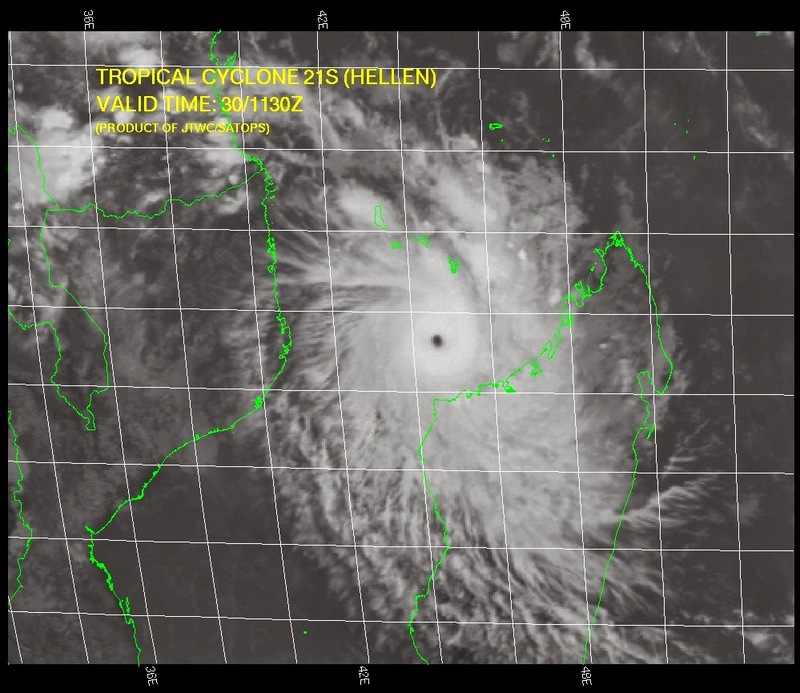 Finally, down in the Southern Hemisphere, intense Tropical Cyclone Hellen (gusts to 160 kts this morning) threatens Madagascar before it turns westward toward Africa. Ir image shown above and current forecast shown below. First, above shows severe thunderstorm reports from SPC for yesterday, March 28th. There were more than 200 reports tabulated at SPC. Here at the house, the morning low temperature this morning (March 29th) came in at 35 F, which is a tie for second coldest morning of the entire month. Above and below are comparisons of the ECMWF and GFS operational member forecasts for 500 mb - above forecasts valid at 00 UTC on March 31st and below valid at 00 UTC on April 5th. The ECMWF continues to forecast deeper shortwaves across the Southwest. However, the last comparison I showed verified in favor of the GFS. At 48-hours (above) the GFS is only slightly weaker than ECMWF, but forecast vorticity advection is substantially different over northern Arizona. By 168-hours (below) the forecasts are quite different over all of the West, with large differences in height over southern California and northern Baja. Will watch to see how the two models play out during the coming week. First - a bit on a chilly morning here in the Tucson area. Dewpoints were quite low yesterday and I checked on the NWS grid point forecasts of morning low temperatures for today (March 28th) - checked the grids last evening around 7 pm. The following is a quick verification of the grid forecasts at a number of locations: TUS low 47 or 48F (48F); here at house low 37F (50F); Mt. Lemmon Sollers RAWS low 32F (39F); Empire RAWS low 33F (39F); Mt. Hopkins RAWS low 34F (41F) and Nogales low 39F (43F). While the forecast for the airport (forecasts are in parens) was quite accurate, but all the rest of the grid point forecasts I checked were systematically too warm by 4 to 13F. The ECMWF forecasts a progression of short waves at 500 mb to move across the Great Basin/Southwest and then across the Central and Southern Plains during the coming 10 days (there is also a 500 mb short wave crossing the Plains today). The three forecasts above are valid at 00 UTC on March 31, April 3rd, and April 5th (24-h height changes are in orange and blue). The forecasts promise little except cool windy periods for southern Arizona, but severe thunderstorm activity should be associated with each of these shortwaves as they move east of the mountains. MANY FARMS AND THE AREA FROM KAYENTA TO TEEC NOS POS. There were quite a few thunderstorms around yesterday but rain at the ground was mostly just spits and sprinkles. No site across the ALERT network reported 0.04" or more yesterday. Tried to grab some CG plots from Atmo page but none of the products this morning reached back to yesterday afternoon - the number of CGs in eastern Pima County was impressive though. The attempt at a 00 UTC sounding from the NWS Office on campus is shown above. Even the new Vaisala sonde failed, apparently after it spent a bit of time in a thunderstorm updraft, exhibiting severe wet-bulbing when it exited into dry near-environment air. The WRF-NAM early forecast from Atmo today forecasts little in the way of radar echoe, but continues to forecast widespread, strong winds across much of the Southwest. The forecasts valid at 2 pm MST this afternoon are shown below - the 1.8 km grid forecast is top and 5.4 km grid forecast is at bottom. Updated at 3:45 pm - quite a bit of cloud-to-ground lightning across eastern Pima County this afternoon. Thunder and sprinkles here at the house. Over around Grant and Dodge there appeared to be measurable rain and drops were large, cold, and with some mushy ice content. The WRF-NAM from 5 am this morning forecasts numerous buildups and some sprinkles around this afternoon. Above is forecast of composite radar echoes valid at 1 pm MST this afternoon and below is the verifying radar image from 1 pm. Tomorrow the model forecasts diminished shower activity but strong and gusty winds. Forecast below is of 10-m winds valid at 4 pm. The winds are forecat to be strongest across the northern portion of the forecast domain. For many days this month the upper-air data from Yuma, Arizona, have been very suspect. See the plot at 500 mb above from 12 UTC this morning, with data plotted at Yuma being obviously bad. The sounding plot below shows what the problem is. Some time this month data were entered with a date of March 29, 2014. This bad sounding will apparently stay in the UA system until we get past March 29th. Why the problem has not been identified and corrected is a bit of a mystery. This morning it appears that the ECMWF is trending toward the GFS wrt the short wave forecast across Arizona on Wednesday and Wednesday night (the 26th), so the GFS may prevail for this event. The 48-hour forecasts from this morning are now forecasting 500 mb heights across central Arizona to be about 5640 m in both forecasts (ECMWF above and GFS below), with the short wave becoming a low amplitude, fast-moving feature within nearly zonal flow. The early run of the WRF-NAM at Atmo last night forecasts gusty winds across Arizona and New Mexico on Wednesday afternoon (bottom graphic is 10-m winds valid at 2 pm), with strongest winds across northern portions of the states and also out west along the Colorado River. Will check the WRF forecasts again tomorrow. First a bit on morning lows here at the house. While the official TUS low temperatures have been running mostly in upper-40s and low 50s F since I returned from Colorado, it has been considerably cooler here. Morning lows since March 10th have been running from the middle-30s to around 40 F (coldest has been 34 F on the 19th). So chilly mornings continue, with large diurnal swings in temperature. This week the global models forecast the strongest 500 mb short wave since March 1st to move across the Southwest. The forecasts for 500 mb here are from the operational models initialized at 00 UTC last evening and are valid at 5 pm MST Wednesday, March 26th. The GFS is above and the ECMWF is below. As is often the case, the ECMWF forecasts a short wave that is deeper and further south than does the GFS. The ECMWF heights are about 60 m lower across all of Arizona. The short wave has a negative tilt as it digs from the Pacific toward Arizona and the ECMWF primary vorticity maximum is shifted south and west, relative to that in the GFS forecast. So, it appears that winds will kick up on Wednesday afternoon and that there will be some precipitation for Arizona. The details will determine how far south the precipitation might reach and the Atmo WRF forecasts will be of interest tomorrow and Tuesday. The system that will impact the Southwest is currently south of Alaska around 150 W - see CIMSS morphed composite of precipitable water (PW) below. There is a nice pool of moisture northeast of Hawaii and this narrows into a distinct atmospheric river north of 30 N. It will be of interest to follow the evolution of PW as the mid-week system approaches. 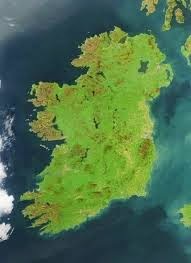 At least there is finally a bit more weather to follow for this part of the country. 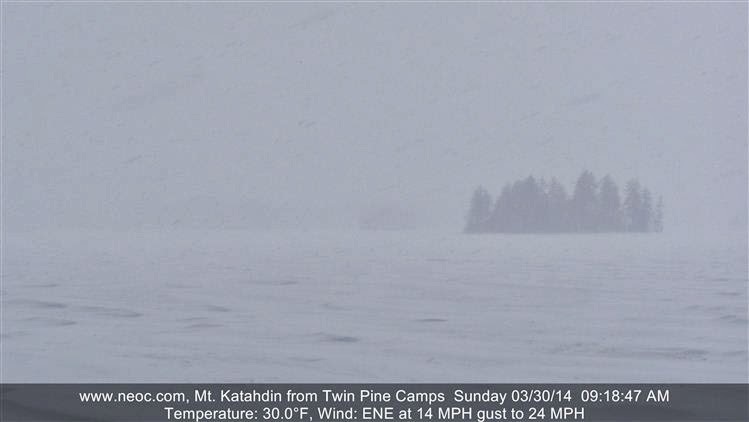 Looks like spring will be a bit late up in Ely, Minnesota. The last rain here at the house occurred on March 1st, while I was out of town. Neighbor John Ferner shot a number of photographs of the brilliant rainbow - apparently this rainbow was so bright and spectacular that some national media carried photos of it the next day. Thanks to John for sharing these. Over the weekend Mt. Lemmon experienced over 75 mph winds which dropped a significant amount of dead trees. Catalina Highway ended up closing on Saturday. Marshal Gulch and Organization road was still closed on Sunday due to a downed tree on a power line. If I have time at the end of the day today I am going to check Bigalow and Bear Wallow road for hazard trees as well as Rose Canyon and Spencer Canyon because the sheriffs did not check those areas. I will document my findings and report back to you this week. Report above from the Forest Service - note that Catalina Highway was closed during part of the weekend. I checked the wind gusts at RAWS sites and found: 59 mph at Guthrie around 4 pm MST on Saturday; 53 mph at Mt. Hopins around 8 am on Sunday; 48 mph at Muleshoe Ranch just after midnight on Saturday; and 46 mph at Sollers on Mt. Lemmon just after midnight Saturday night. Edited to add: Mike Leuthold sent along WRF forecast of surface wind speeds valid at 08 UTC (above - for 1 am MST) on Sunday morning (March 16th). Note the winds at middle and foothills elevations were forecast to be over 20 m/s - the spatial distribution of the high winds suggests a surfacing mountain wave. The TUS sounding from 12 UTC on the 16th (below) certainly appears favorable for this to occur - note the very strong NE winds and pronounced inversion present just above mountain-top levels. Model also forecasted very strong winds in the Kitt Peak and Baboquivari Peak region (left near bottom). Spring snow today along the Colorado Front Range and up in the Rockies. 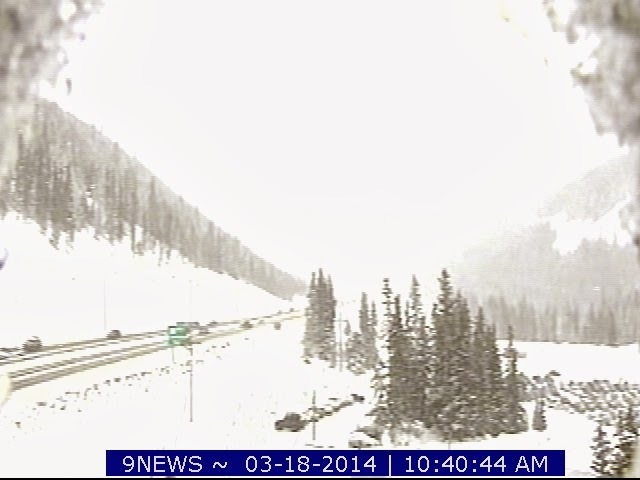 Photo above shows I-70 just east of the Eisenhower Tunnel - definitely still winter up there. 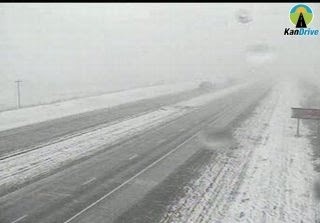 Edited to add: Below is webcam view of I-70 at Goodland, Kansas, at about 2:30 pm MST this afternoon. Yet more snow and cold today in Mid-Atlantic and northeast states - above is am image from Washington, D.C., and below is a 12 UTC surface plot from NCAR RAL for the area where winter continues to hold sway. Meanwhile the GFS forecasts more of the same for the next seven days (through Sunday the 23rd) below, which shows forecast of total precipitation for the period. This morning's NWS forecast for the Tucson airport grid point indicates high temperatures from 80 to 83 F for each of the next seven days - guess that's a persistence forecast with only March Madness to look forward to, and that's no blarney. Updated - about 2 pm on Saturday March 15th - winds in the Tucson metro area have kicked up with stronger gusts than expected this afternoon as a trailing short wave at 500 mb digs southward along Arizona/New Mexico border. 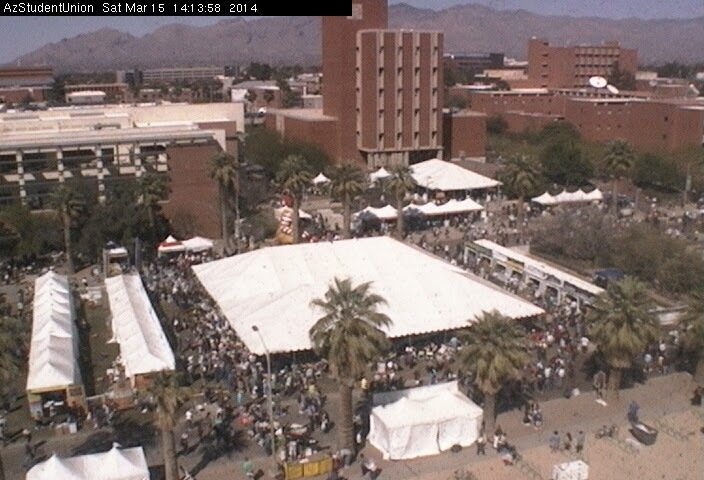 Looks like the Festival crowds are not being detered (just above). Temperatures are in the mid-70s but winds across the metro area are gusting 25 to 30 mph -surface plot with gusts in red from MesoWest at just before 2 pm MST is shown below. 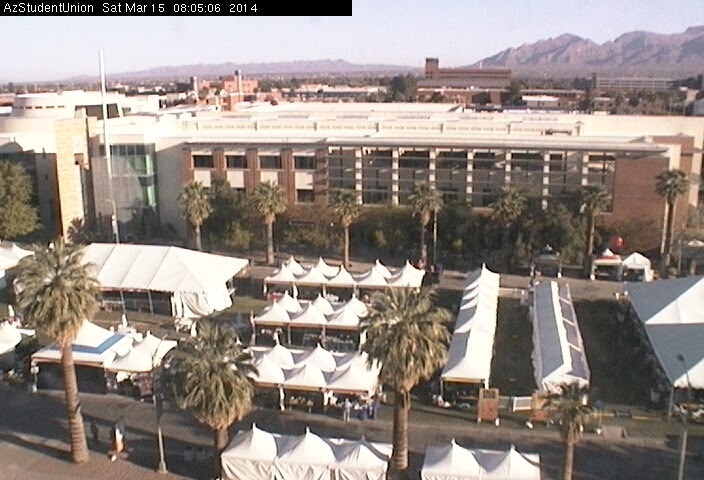 The 2014 Tucson Festival of Books will be underway shortly on the Mall at the University of Arizona. Attendance is expected to reach 100,000, which is quite something for a literary, non-sporting event. The first day of the event will play out considerably nicer than last year's cold and raw start - may be some winds this afternoon but temperatures are much more civilized this year. The 500 mb short wave that is currently crossing over southeastern Arizona is producing some light rain showers. Above is visible image (all images here are valid at or near 2 pm MST) showing the activity from above. Below is this morning's NAM forecast of 500 mb features and bottom is composite radar image. There have been a couple of light spits of rain here at the house.